In the current times, users are increasingly attracted towards the digital world. Even the companies and organizations use various online platforms for cross-communication. MS Outlook is one such platform that allows users to exchange essential data and information via emails, attachments, etc. It is a well-known fact that Outlook stores its file in PST (Personal Storage Table) format. However, if there are heaps of PST files, user can get lost under the bulk of Outlook PST files. When a large number of PST files exist, it is best to have them organized in order to attain a better manageability. To address this issue, PST Merge software has been devised. This tool is capable to combine multiple PST files into one with total ease. In the following section, we will discuss some of the user queries to have a deeper insight into the working and demand of PST file combiner tool. PST combiner is an amazing utility that is designed to merge or join multiple PST files including email items, tasks, notes, journal, contacts, etc. into one. It can even merge contact files in Outlook. 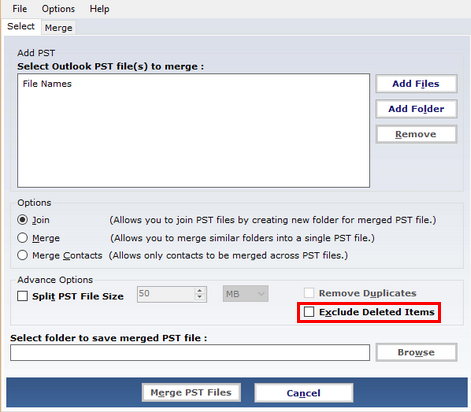 Not only this but it also has an inbuilt mechanism to delete and merge duplicated items within PST Outlook files. Moreover, this PST merge utility has no file size limitation and can process both ANSI and UNICODE types of PST files. The PST Merger application has a very smooth and easy interface. It supports 2016 and all other below versions of MS Outlook. This software for merging PST files and contacts is extremely efficient and generates optimized PST fragments. Supported MS Outlook Versions: Microsoft Office 2016, 2013, 2010, 2007, 2003, etc. What Tool Does: The tool merges multiple PST Outlook files into one. This PST combiner possess two versions which are, FREE Version and FULL Version. Users can choose any of the two given versions as per their requirements. Since this is the free version of the application for consolidating PST files so, it comes with certain restriction. Users can merge first 15 PST items, first 15 PST contacts and first 2 PST folders by this PST combining tool. This version is free of cost and operates in the same manner as the full version. This licensed version of Outlook PST Joining software has no limitations at all. In this version, users are allowed to merge as many Outlook PST files as they wish to. Users can buy the full version of the software to avail endless combing of PST files along with all the latest features. The PST Combiner Utility lets users consolidate PST files by the three different options, which are as mentioned below. Join PST Files: By this option, user can easily combine two or more Outlook PST files by creating New Folder for combined files. 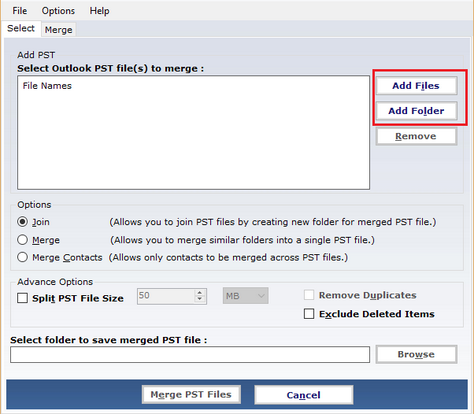 Merge PST Files: By this option, user can merge some similar Outlook PST folders into a single PST file. Merge PST Contacts: By this option, user can combine the desired contacts and merge them in multiple PST files. PST merge tool has ability to combine multiple PST files by erasing the duplicate contents within PST Outlook so that the user has access to complete data without coming across any duplicate items. But user can unmark this option, if there is no such requirement. This PST consolidating tool has potential to merge PST contacts into one file and also removes the duplicate contacts within the Outlook PST files. Thus, this tool not only merges and removes duplicate PST email messages but also the PST contacts. The PST combiner tool allows adding a folder for joining various Outlook files. This feature gives users an option to add all Outlook files at once. 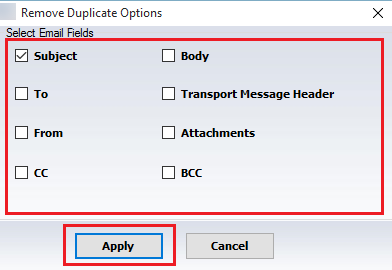 Due to this feature, user does not have to search for each and every Outlook PST file individually and can directly merge multiple PST folders altogether. Using this feature of PST Merge utility, user can not just combine PST Outlook emails but the entire email contents like notes, tasks, contacts, journals and much more. All the selected contents are merged into a single PST file, that is of UNICODE type by this merging software. 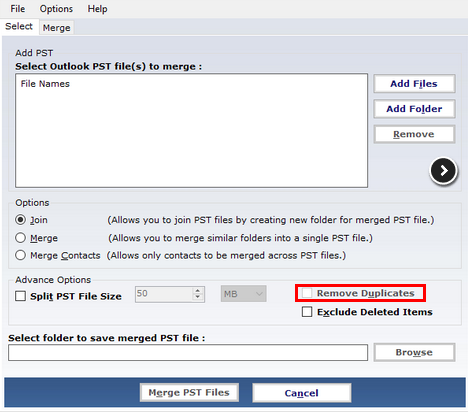 While consolidating two PST data files into one then, if a user does not wish to merge deleted items files/folders then, just mark the option to exclude the removed PST folder items. By this feature, the tool will not consolidate erased item folders into the merged Outlook files. This helps users in reducing the time taken in deleting PST items. 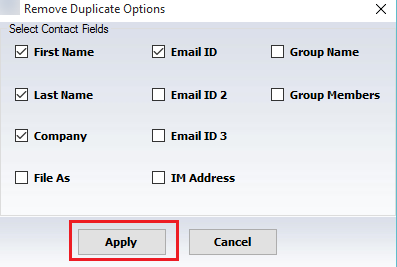 Option to delete duplicate PST items and contacts. Option to exclude deleted items within PST files. No file size restriction for consolidation of PST files. Ability to merge both UNICODE and ANSI PST files. Windows based software to join PST files. Free version will merge only first 15 emails. PST Merge Software is the ultimate tool for combining multiple Outlook PST files into one. The software is blessed with amazing features keeping in mind the demands of all types of users while merging Outlook PST data. It makes joining of Outlook files so easy and based on its overall performance I would like to rate this software as 9.7/10. This PST Merging Software yields extremely satisfying results and lives up to the user expectations.